Hygienic flooring is essential in premises like hospitals and care homes, for industrial flooring where there is likely to be water for a large amount of the time, and is preferable in a wide range of other locations to keep the surface clean not only of dirt, but of any relevant contaminants and health hazards. Unlike most industrial flooring, where a completely flat surface may be wanted, there may need to be slightly sloped surface, in order to make sure that any excess water drains in the correct direction. Call 0151 355 3519 for a quote today. Poured resin flooring not only allows for this, but can give a completely seamless surface so there are no raised joins or edges to act as physical barriers to the flow of run-off water. Resin can be poured up to the level of any existing drainage grids, grates and grilles, again to make sure that the water run-off is able to reach the drains without any upward slopes or edges in its way. Thicker resin floors make particularly good hygienic flooring, as they can be deep cleaned without causing any damage to the resin – a must if your floor will face regular intensive cleaning over a prolonged period of time. Primers can be added to the existing surface before the resin is poured, and this means the finished surface will not only be hygienic, but can be given a damp-proof membrane too, for extra protection of the concrete below in environments like wet rooms. Non-porous and hard wearing in wet environments. Smooth, seamless and can slope downwards towards drainage grates. Can be textured for added grip in slippery settings. 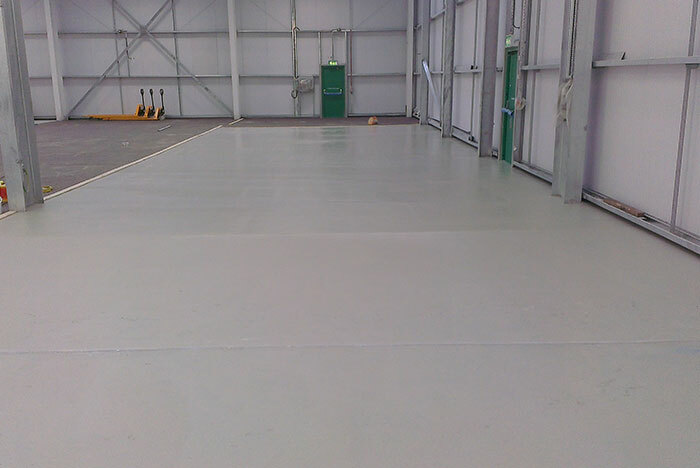 As with any industrial installation, we work quickly and cleanly to put hygienic flooring in place, with a seamless surface and any required slopes for drainage. We provide the expert manpower and the machinery required, and can complete installation with a smooth transition from the surface to the walls where this is needed for extra hygiene. We can also use coloured resin or epoxy paints to mark safe routes and any other warnings you may need, to further enhance health and safety for the people who use your newly laid floor on a daily basis.